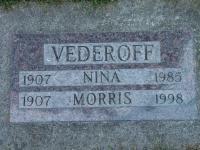 Arnott and Vederoff Ancestors - Headstone of Morris and Nina Vederoff. Lake View Cemetery, plot #1 N1/2 60 B.
Headstone of Morris and Nina Vederoff. Lake View Cemetery, plot #1 N1/2 60 B.